She has become the poster child for family separation at the border — and the subsequent moral outrage against the Trump administration — but the crying Honduran child held up as a heartbreaking example of family separation at the border was, in fact, never separated from the parent with whom she illegally crossed the border into the U.S. The two-year-old girl, Yanela, and her mother, Sandra, were detained in Texas after attempting to cross the Rio Grande river, and were held together. Hernandez added that he heard through family members his daughter and wife were not separated at the border when caught by Border Patrol. “I don’t have any resentment for my wife, but I do think it was irresponsible of her to take the baby with her in her arms because we don’t know what could happen,” Hernandez said of Sandra and Yanela’s attempt to cross the border, adding that he would not attempt the trip himself. 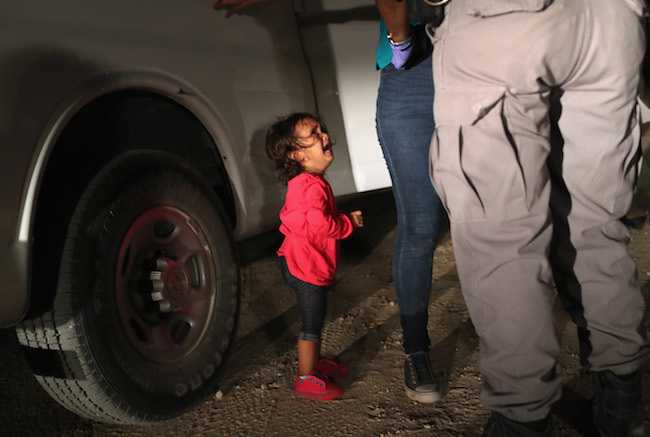 The photo of Yanela crying has surged across various media outlets as a way to pinpoint the Trump administration for separating families at the border. TIME magazine recently came out with a photo of Trump staring down at the little Honduran girl. However, as her father stated, the little girl was never actually separated from her mother as they both attempted to cross the border, making the TIME cover misleading at best.